The material of interest is illuminated with a monochromatic light source (typically a laser) and the returning light is measured. Due to scattering caused by the interaction between light and matter, the formerly monochromatic light that has interacted with the sample material experiences changes in wavelength. Detected spectra include, therefore, not only the excitation wavelength (via both reflection and Rayleigh scattering), but also a red and blue shift known as the Stokes and anti-Stokes effects respectively. This is due to the reactions of molecules in the material to the incident light: namely, vibration and rotation at characteristic frequencies as determined by molecular bonds. 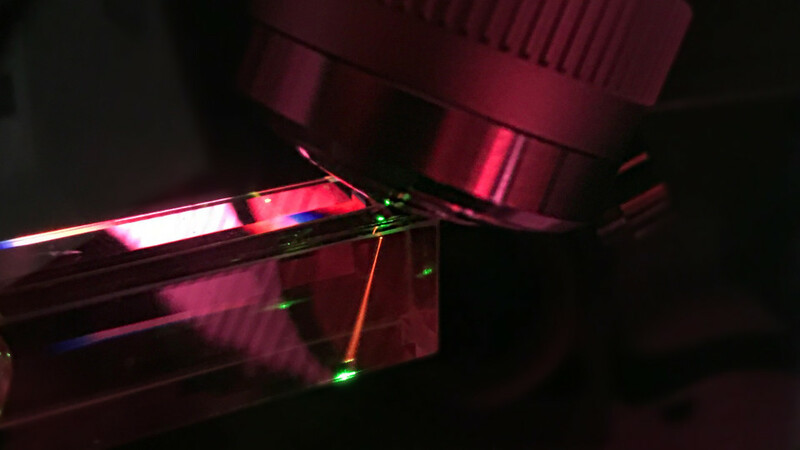 Therefore, by observing the scattered light, Raman spectroscopy enables the determination of molecular bonding type, organic composition and a variety of other chemical properties. Stokes and anti-Stokes scattering are symmetrical phenomena on a wave-number axis centered on the excitation/Rayleigh wavelength. They occur only in the case of characteristic vibration and rotation and cause an energy shift of the scattered light, whereas Rayleigh scattering does not affect energy or wavelength. 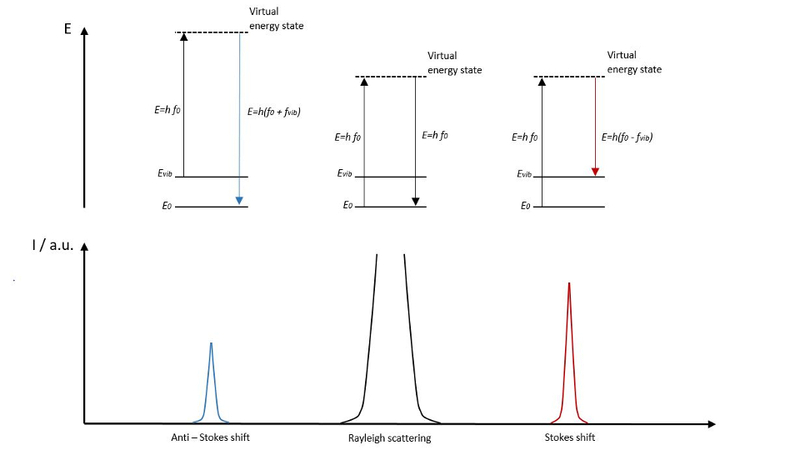 In the case of the Stokes effect, wherein light is red-shifted, the energy of the scattered light is lower than that of the excitation source by a factor exactly equal to the vibrational energy of the excited molecules. The anti-Stokes effect – a blue shift from the excitation wavelength – is characterized by an energy increase as compared to the light source caused by vibrational energy already present in the radiated molecules which is transferred to the scattered light. According to the Boltzmann equation, Stokes shifts occur with higher probability than anti-Stokes and are therefore typically detected with much higher intensity. For this reason, many measurement systems rely more on detection of Stokes than anti-Stokes. 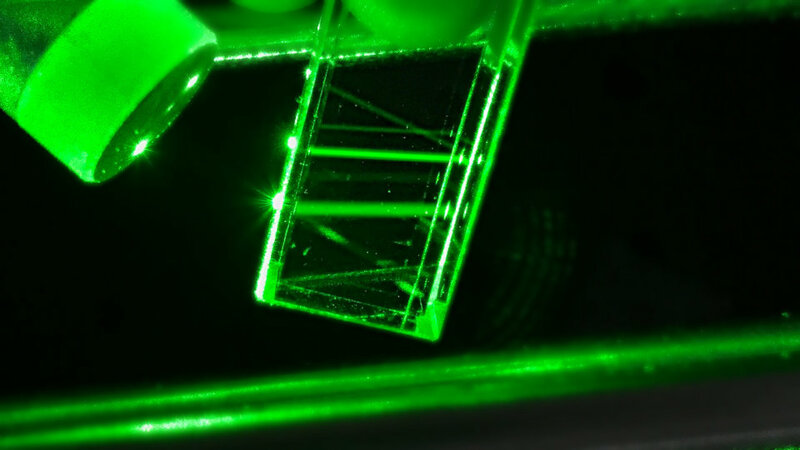 As a state-of-the-art technique, spectroscopy offers many experimental possibilities to acquire compositional information of materials. Raman spectroscopy is particularly suited to the collection of information about chemical and molecular structure, and therefore highly applicable in not only research, but also industry. 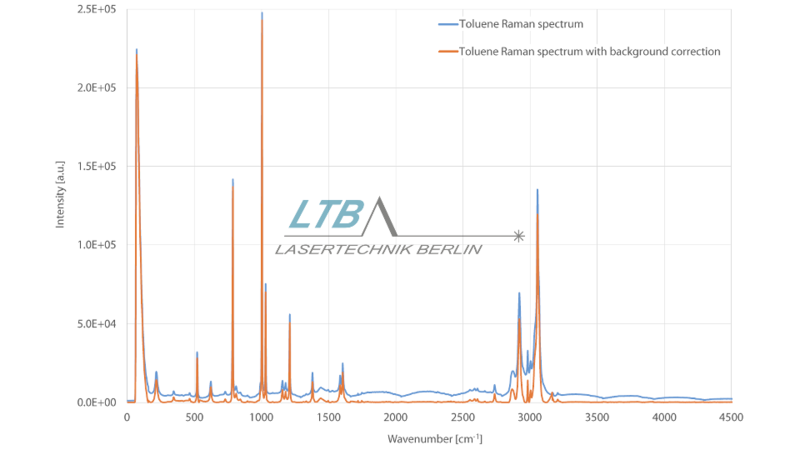 One such development already undertaken by LTB Lasertechnik Berlin is a single Echelle spectroscopy system capable of both Raman and LIBS measurements. This combined apparatus therefore enables the measurement of not only the composition of a material, but also its molecular structure. The potential applications of such a flexible system are innumerable – examples might include the measurement of geological samples, organic and inorganic materials, metallic alloys and even pharmaceutical compounds.